Last year, Hardwell and social enterprise GuestList4Good set a target to bring an educational programme to more than 100,000 young children from the slums of Mumbai. 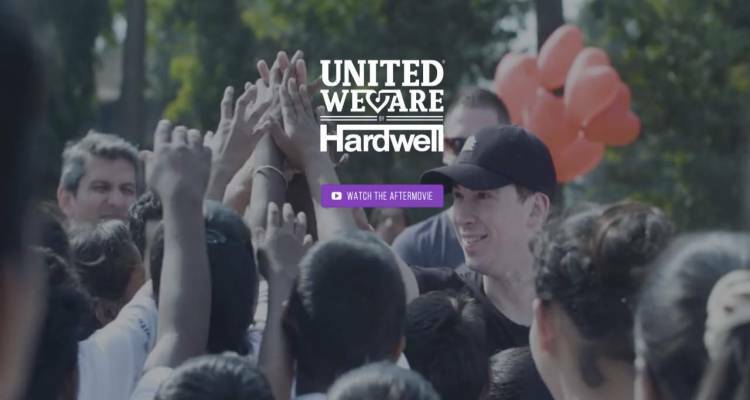 Following a successful aid concert with the 'World's Biggest Guestlist' festival Hardwell and the United We Are Foundation are releasing the official aftermovie and make available exclusive merchandise. The merchandise is made available through the United We Are Messenger bot. The delivery of this was made possible with the help of messaging and payments company CM.com & The Bot Platform, who are enabling fans and supporters of the charity's ambitions to make their charitable purchase via the exclusive United We Are Messenger bot. Hardwell said: "Thanks to the incredible love and support of the fans we managed to achieve something truly historic with our launch event back in 2015. To go back and set the bar even higher and secure enough funding to educate 100,000 children, is something very special."